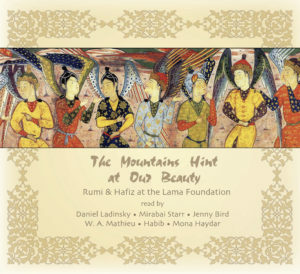 Four-and-a-half years ago a group of talented artists, musicians, and poets, all lovers of Lama, began an audio project, focused around the poetry of Rumi and Hafiz, translated by Daniel La dinsky, as a generous donation to the Foundation. This week, we are very proud and excited to announce the CD release! This 25 track album is a meditation of the heart. Each poem, read with musical accompaniment, imparts wisdom so sweetly that the listener is transported directly to the poet’s intent. All proceeds from the sales of this amazing project go directly to Lama, in support of Lama’s scholarship fund and of the land. This is truly a treasure to be shared. Only $7.00, includes a 44 page booklet with poetry and photos.